I don’t often go to Hounslow, although its only a few miles away. I can get on a bus a short walk away and it will take me there, though it’s faster to either take the train to Hounslow or get off a stop before and catch a bus, depending on which part of Hounslow I want to go to. But not a lot happens there. Not a lot happened there in the eighteen or so years I lived there until I left for university. A few years later my family had all moved away, and there didn’t seem a great deal to go back there for. But on a Thursday morning I found myself standing alone at a bus stop outside Eaton House, the Hounslow Reporting Centre. Most asylum seekers have to report either daily, weekly or monthly at one of these centres – there are around 15 covering the whole country – or sometimes at a police station. They get fingerprinted and their biometric ID cards are reactivated. Or they may be taken from the interview room and put into a holding cell, to be transferred to one of our immigration prisons (officially called detention centres) to await deportation. Eaton House serves those living in much of West London and further afield, and certainly wasn’t chosen as the easiest place to find or travel to, on the western edge of Hounslow. Reporting often seems to be a way to harass asylum seekers rather than anything more. 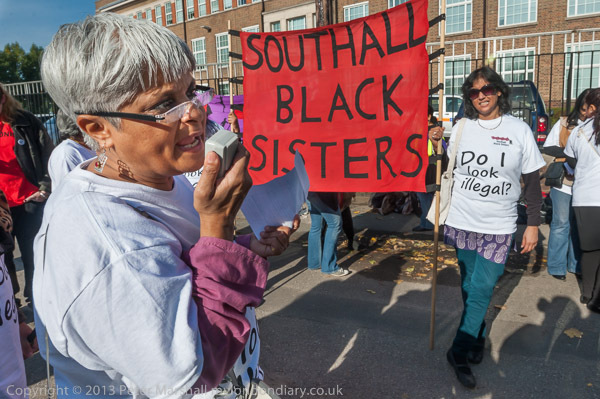 Southall Black Sisters was founded in 1979 to fight for the human rights of Black (Asian and African-Caribbean) women and like many others are appalled at the growing racism of government legislation and activities against asylum seekers and other migrants. I’ve photographed them taking part in many events over the years, but I think this was the first organised by them I’d been to. But this time, coming from Feltham, my bus was dead on time and I arrived a few minutes early and I walked up and down, then sat down at the seat inside the bus shelter and waited hopefully. I like to get to protests a few minutes early, but it’s always nice to have a others gathering there so you know something will happen, and as the start time approached I was beginning to wonder if I was wasting my time. 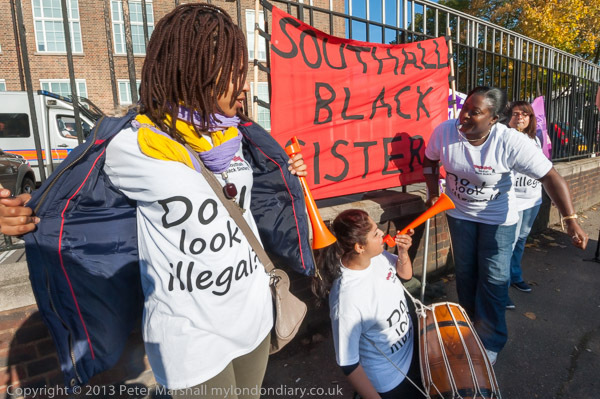 But Southall Black Sisters arrived on the dot, a minute before the advertised time and the protest got underway. Many of those taking part were wearing the group’s white t-shirt with the message ‘Do I look illegal!’ printed very large on its front, and with the protest involving quite a lot of activity it proved surprising difficult to get images in which this was fully legible, as you can see in Southall Black Sisters Protest Racist UKBA. There were a few interesting moments, particularly when police officers tried to liaise with the women, and when one officer complained about the language one of them had used shouting at a man walking by who had made a racist comment, and was surrounded by the women telling him he should be taking action against racists, not those who stood up to them. The officer claimed to have been unaware of the comment that had been made, and eventually backed away as women shouted at him and blew whistles and vuvuzelas. But although I took pictures, it was perhaps something that would have been rather better recorded on video. I’d not heard either the racist comment or the response the officer objected to. My time at the protest was limited as I wanted to be in central London for another event, involving a journey by bus, then a short walk to the underground at Hounslow East from where the Piccadilly line would take me, very slowly, to my destination. I was beginning to get worried that I hadn’t really managed to take an image that really worked about the protest as a whole, when I made the one at the top of this post, showing the Director of Southall Black Sisters, Pragna Patel speaking. I’d moved around very close behind her using the 16-35mm on the D700. This was the sixth of seven frames; at first I’d been a little further back, and working at 16mm, and she had been partly obscuring the banner. I’d been working with the banner and to its right a group of the women with drums and horns in front of the UKBA fence and building, and Pragna Patel was reading from a list of slogans in her hand. As she turned her head around more towards me I zoomed in slightly for a frame and then stepped closer to tighten the framing a little. Even so, the image, taken at 20mm, needed a little cropping mainly at the right of the frame, and this also enabled me to bring the top of the image to the top of the banner. I’ve retained the 3:2 aspect ratio, though I think it might improve the picture with just a little more off the right hand edge. You can see my shadow in the bottom right by the way, and the t-shirt of the woman holding the banner is nicely legible, with a curve in her stance that seems to send my eye back into the picture. I took one more frame immediately after this, almost identical except that the speaker’s mouth had closed and her head moved very slightly forward. As soon as I had taken these two images I thought I had managed what I needed, and, moving back a little, made a quick check on the screen on the back of the camera to confirm this. I don’t often stop to ‘chimp’ when taking pictures (and often get annoyed with photographers who keep standing in the way of others to do so) but wanted to be sure. As I looked up from the camera, I saw my bus coming down the road, and quickly waved goodbye and jumped on it, on my way to take more pictures elsewhere. This entry was posted on Wednesday, November 27th, 2013 at 01:31 pm and is filed under My Own Work, Photo Issues, Political Issues. You can follow any responses to this entry through the RSS 2.0 feed. You can leave a response, or trackback from your own site.